Bulgaria (Republic of Bulgaria) is situated on the Balkan Peninsula, in the South East of Europe. The country covers an area of 110,910 km² and its population compromises of 7.72 million people. The official language is Bulgarian. Nearly 94 % of the educational institutions are public, less than 1% are religious and 5 % are private. Education becomes compulsory when a pupil turns seven until he or she has reached the age of sixteen. Home schooling is illegal, unless the child has a handicap. Generally schools are free of charge. Leaving exams - called “Matura” - have recently been introduced and they are compulsory for everyone graduating from secondary education. There are roughly 2500 kindergartens in Bulgaria, out of which none are religiously based and out of which 30 are private. The minimum entrance age is three. All costs for the children in the state-run or municipal kindergartens are covered by the state, but the parents also pay a small amount of money, determined by the Municipal council. The preparation of children one year before the entrance in first grade at school is compulsory and it is organized in groups, working in cooperation with the kindergartens or the preparatory class in the primarily schools. Parents are not obliged to pay a fee. During an average day breakfast and lunch is provided, an afternoon sleep is arranged for and some activities are organized (learning Bulgarian, sport, music, environment, arts, etc.) Kindergartens can be daylong, half- day long and weekly. There are roughly 1800 primary schools. Almost all of these schools are run and funded by the state. 30 are private. The grading system used in Bulgaria consists of a five point scale. 2 is the worst possible grade, 6 the best. The seven year primary education is divided into two stages, where the second stage starts after the fourth year. In the first stage classes consist of 16 to 22 students. In the second stage there are 18 to 26 students. 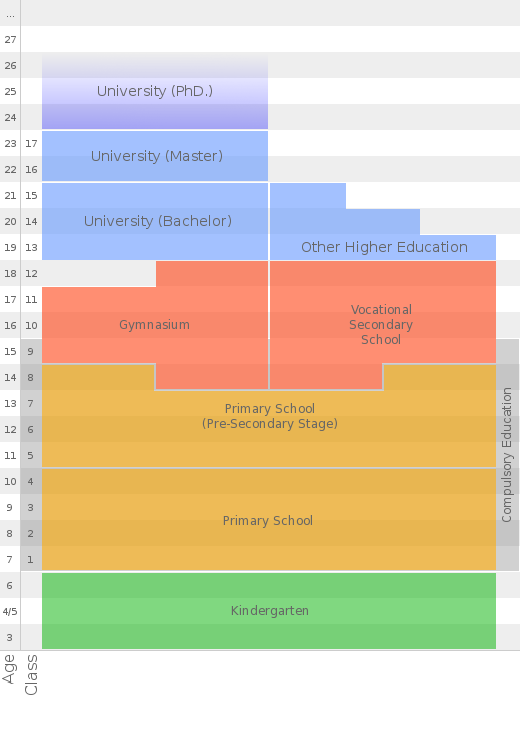 An average day in primary school typically starts at 07:30 and ends at 12:30. Timetables are regulated quite strictly and are organized nation-wide. Furthermore, the majority of primary schools have computer labs available to students. No school uniforms are compulsory by law, but they are sometimes implemented by individual schools. Also, school meals are supplied and the first stage students even get breakfast provided. Electives in primary school are available. Extracurricular activities are sometimes organised by schools, which is allowed if these activities relate to the development of interests, abilities and necessities of the students in the areas of sport, science, techniques and arts. There are roughly 1100 schools. Out of them 600 are mathematical, language schools, grammar, sport schools, church, art and specialized schools. There are also 500 professional schools. 80 of all the schools are private, the others are public. Parents pay for the education of their child. The grading system used in Bulgaria consists of a five point scale. 2 is the worst possible grade, 6 the best. Students can choose their own school. The legislated maximum of students per class is 26. An average school day typically starts at 07:30 and ends at 16:00. Teaching is organised in 45 minute blocks. Friday afternoon there are usually no classes. A student has to choose a few subjects and can pick additional ones if desired. Schools sometimes have entrance exams and grades from the last year of primary school are also sometimes used. There is a leaving exam in place. Furthermore, the majority of secondary schools have computer labs available to students. No school uniforms are compulsory and no school meals are supplied. Extracurricular activities are often organised by a school. The best students from all types of schools receive a monthly scholarship. This scholarship is around 21 Levs a month. There are 43 universities (out of which 16 are private), 10 colleges (out of which 9 are private) and 23 private professional colleges. All institutions have some kind of competitive entry process. Most have entry exams. Disabled students are completely excluded from the regular school system. They go to special schools or receive some teaching at home. Action is being taken to change this. Another future change that is going to take place is the division of secondary education in two stages, like the primary schools. The first secondary stage includes the 8th, 9th and 10th grade. At the end of these three year the students finish compulsory education and depending on the results they can continue the next stage or try to find a job with help of special programs of the Ministry of Labor and Social Policy. The second secondary stage includes the 11th and 12th grade. Of course the educational system has problems. One of the most serious questions of all, related to education and upbringing, is the high number of drop-outs in comparison to other EU countries.